I survived about an hour this morning on Carlton Moor. Battered by the wind and soaked by the rain. Decided to return along the north-west facing Faceby Bank following the ruined dry stone wall of Great Bonny Cliff Wood in the shelter of Carlton Moor. 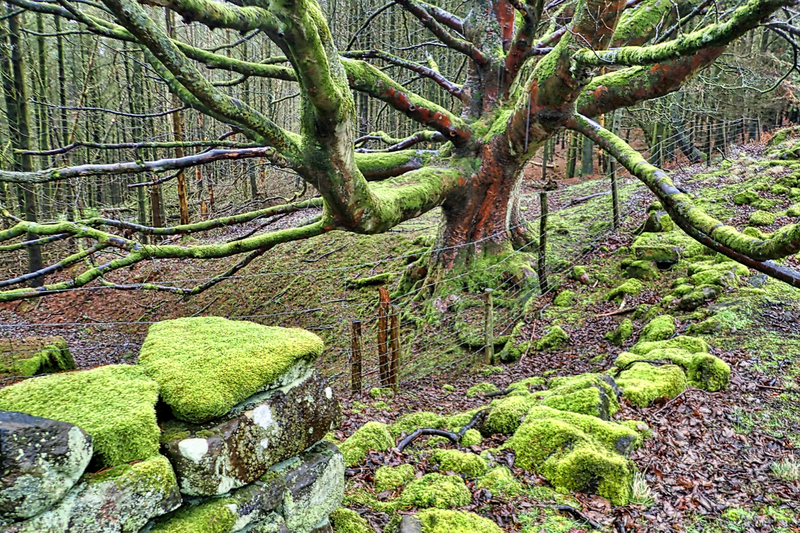 Came across this peaceful spot dominated by an amazing old oak beside an old dry stone wall and everywhere covered by with a mantle of green moss. It’s interesting Mick, there are a number of old deciduous trees along the line of the wall and scattered about in the wood where the coniferous tree planters couldn’t reach or gave up.